Empty can of apples in a pot (drain but retain juice if needed later) put entire can of butterscotch in pot and simmer. After 10 minutes add vanilla as desired. 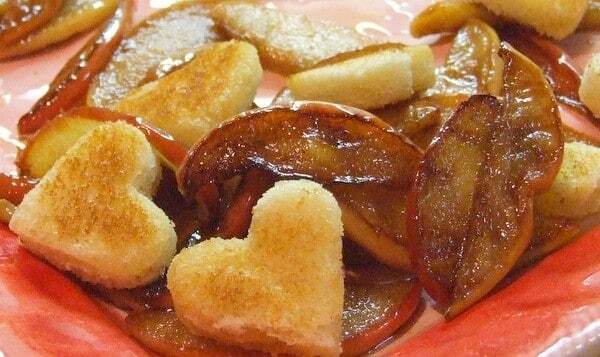 Using the softer slices of toasted pound cake cut out hearts. Breakup the leftover scraps and place in bowls. If you over bake you won't be able to cut out the darker pieces with a cutout tool. Add the apple and some broth to the pound cake. Top with some strawberry. Top with a heart cut out or several as desired. This recipe was modified from Nigella Lawson's recipe to work with a crowd. The original called for white country bread, slices and sauteed apples, butter and vanilla. Credit to Nigella Lawson's book Nigella Express and Lori Lange for her changes too. This recipe was modified from Nigella Lawson’s recipe to work with a crowd. The original called for white country bread, slices and sauteed apples, butter and vanilla.